The word is out! On March 10, I was honoured to be chosen the North Island-Powell River Green candidate for the coming federal election. Thank you for your confidence. Though we brought different skills and perspectives to the contest, the other nominee, Blair Cusack, was equally qualified, and we are thrilled to now work together on my campaign to win our riding. An excellent team is rapidly forming around this quest, and campaigning will start in earnest in the next few weeks. One of my initial activities will be door-to-door canvassing to meet the people of NIPR, listening closely to their issues and concerns. I want to engage with every voter to discover how together our ideas can advance a progressive vision for Canada, and inspire them to become part of the Green wave. My goal is ambitious – to visit every NIPR home over the next 7 months! And, to raise the funds for a topnotch campaign. In a big riding like ours, travel, lots of signs, and setting up Green offices in several of our major communities all require solid funding. It’s all about connecting and listening, and expanding the compelling Green vision. Climate emergency will make this the campaign of our lives! What an opportunity to build a mighty Green wave, and then bring that to Ottawa. We need your help! Above all, it’s going to be fun. That’s the Green way. Join with me! You can reach me at mark.debruijn@greenparty.ca. Great news: North Island-Powell River Green Party now has a candidate for the 2019 election! So how did the Election Readiness Committee help? Over an 18 month period a group met regularly with the main aim of finding the best person, a local hero, to represent you as the Green Candidate in the 2019 election. All Green Party members in the riding were asked more than once for suggestions and those provided were followed up. At least 30 people from all parts of the riding were seriously considered; about half of those were met with by members of the committee. In the end there were 2 nominees who wished to represent you. To help you decide who to vote for, three Meet the Nominees meetings were held during February, in Campbell River, Comox and Powell River. The final vote took place at the Nomination Meeting on March 10. Using the wonders of modern technology this was held simultaneously in Powell River and Black Creek, either side of the Salish sea, a first in this riding, enhancing democratic participation, one of the Green principles. Thank you to all the members of this committee. Thank you to all of you for your support and participation. What have we been doing since the last newsletter came out? Read on…. Six NIPR Executive members attended the Convention, and it was a pretty exciting time! Watch Elizabeth’s keynote address here. Thomas Homer-Dixon spoke about HOPE. It is about finding hope in the face of a very serious crisis. And it resonated with the convention theme: Time for the Truth - about democracy - about global corporate rule, and about climate change. For each of those themes, speakers delivered the message of: First we face facts, then we come forward with the solutions, and we inspire and mobilize for those solutions. “Time for the Truth on democracy was ALL about getting rid of FPTP — Caroline Lucas’s keynote linked FPTP and Brexit and the calamities of British politics. And the full plenary panel on Sunday was all about PR - with David Merner moderating, New Zealand MP Gareth Hughes, and our own Sonia Furstenau. “Time for the Truth on global corporate rule included a plenary of Paul Manly’s new documentary on the Bilcon case in Nova Scotia. That plenary continued in a workshop, as well as table talks to ensure a deeper understanding among Greens of the threats of ISDS and NAFTA. “Time for the Truth on climate had Grand Chief Stewart Phillip and Thomas Homer-Dixon speaking, with a strong dose of reconciliation. Grand Chief Stewart Philip had never spoken to a political party convention before. Speaking of reconciliation, the Convention two MCs… and they were both Indigenous women - Racelle Kooy and Lorraine Rekmans. Adam Olsen’s keynote on wild salmon also stressed the Indigenous world view. It woke people up from other provinces about why wild salmon resonates so strongly in BC, but it also injected an important message of respect for other species. One highlight of the convention was when the NIPR EDA received the “Rising Star award,” acknowledging our EDA as one that has greatly improved its participation in the Green Party. The symbol on our award is the loon. Grand Chief Stewart Phillip talked about how he was named for the loon. He thinks the loon is an important symbol because the loon’s “voice is heard all across Turtle Island…and like the loon when it goes under, the government never knows where you’re going to pop up.” So it was especially powerful for NIPR to receive this award. The Rising Star plaque was created by Shain Jackson, from Sechelt. In an interview with CBC, Jackson described being a practicing lawyer when, on one visit home, he realized that their Indigenous law was codified in their art, and he switched to being an artist. The referendum on switching to a proportional voting system in BC failed to get voter support. There is endless speculation on why PR may have failed to catch on, but the result was very clear – first past the post won. While this is a devastating loss to all those people who worked so hard, we have to move forward. Greens in all the ridings, but especially in NIPR, worked incredibly hard on this referendum, and we should all be very, very proud of that effort. 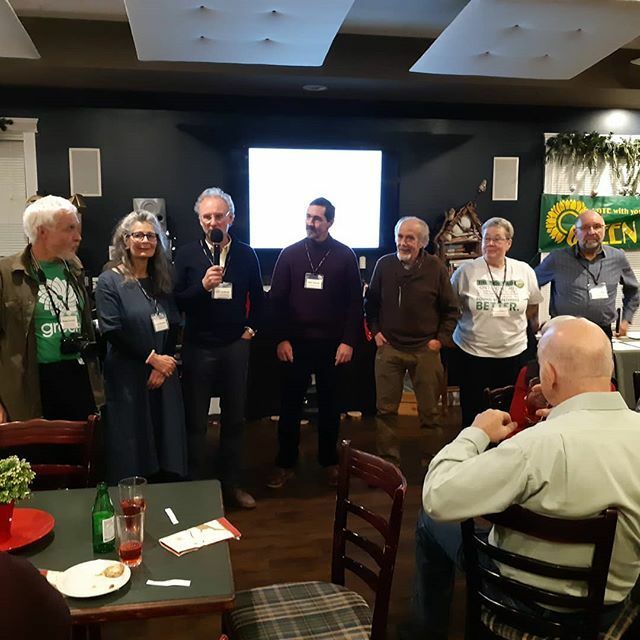 About 40 people attended the Green social at the Comox Golf Club on December 10, 2018. It was great to renew old friendships and create new ones. The support in the room was strong. One of the highlights was watching Elizabeth May’s impassioned speech in Parliament for the emergency debate on the Intergovernmental Panel on Climate Change report. Hurrah—we have a candidate! This great news means we can start canvassing very soon. As the NIPR Volunteer Coordinator, I’ve had the pleasure of talking with many members over the past weeks leading up to the candidate selection. I can’t tell you how energizing it is to talk with you! So many are voicing similar sentiments indicating how ready you are for a new style of politics—one that recognizes and acts on the fact that we’re all in this together and one that is capable of leading intelligently and constructively toward a new era of sustainability. Thank you to those who have already put your names forward as volunteers for NIPR. We will be in touch soon to take you up on your generous offers of support. We believe you represent the vanguard of a host of additional volunteers yet to join our campaign efforts in this break-through year. Our NIPR riding is large. In order to reach and expand our membership throughout its 58,000 square kilometre area, our first priority is to find local volunteers to help organize campaign efforts and events in every community. The foundations are being laid for a really exciting and successful campaign. We look forward to welcoming you to the team–and, to doing this together! To join us please contact me at: niprgreenvolunteers@gmail.com. Remember…Volunteers don’t necessarily have the time but they definitely have the heart to get big things done. One of the things NIPR started in 2017 was a weekly news blog. It’s completely different from this newsletter, which is all about NIPR. The blog, called Did You Know … Must Reads from Last Week, is a compilation of links to news items of interest to Greens. It routinely has sections that are local, provincial, national, and global. Subscribe now and you’ll never miss any news about what’s happening in NIPR. NIPR also uses Twitter (@NIPRGreens), Facebook, and Instagram (@NorthIslandPowellRiverGreens). We have several thousand dollars to start our Election Campaign. Sounds great, but we have one of the largest ridings in Canada. It will take significant funds to allow our candidate to travel across this riding and put up signs to show what our candidate and the Green Party stand for. We will also be using a social media campaign to reach people all across our riding of North Island Powell River. All this costs money. With generous tax credits, as long as you pay taxes you can get a tax refund for donations to the Green Party, as you can see in the attached chart. You will get back 75% of the first $400 you donate to NIPR/Green Party. Send a cheque to NIPR c/o J. Van Oostdam, 1740 Linden Ave, Comox, BC V9M 2L4, or an e-mail money transfer to jvanoostdam@yahoo.com (do indicate in the e-transfer notes that it is for NIPR Green Party and you must add your address so you can get a tax receipt). You can donate directly to NIPR, or you can donate through the Green Party of Canada site. If you choose to use the GPC site, please choose the NIPR riding and donate locally. That way you are specifically helping the local campaign. In general, individual polls are at best a ‘litmus test’ of the emotional state of the electorate at one moment in time, and have limited predictive power many months before any election. However, polling “aggregators” who use and then weight data from several different polling companies produce somewhat more stable, reliable results. This report features the most recent results from three different respected aggregators. Polls often identify electoral trends. These trends over time can indicate strengths, weaknesses and key issues in the political landscape. Political parties can exploit those weaknesses to help perpetuate trends that they prefer, and try to counteract weaknesses that are inimical to their potential success in forthcoming elections. While GPC HQ remains largely responsible for the national strategic electoral “blueprint”, the campaign Team at the constituency level needs to seriously contemplate how it will apply those directives to best engage the electorate. Polling trends/implications can provide the basis for such tactical discussions. The ‘dead heat’ between the leading parties, and the likelihood of a minority Government mean that the Press and the leading parties will attempt to convince voters that they should vote ‘strategically’ to avoid a minority Government. It will be critical for all parties to try to dominate the interpretation and messaging regarding ‘Strategic Voting‘. There is no obvious ‘Green wave‘ in the electorate at the national or provincial level yet. However, the GPC seems to have a decided advantage on Vancouver Island. For polls disaggregated to the riding level there 2,3, indications are that between 3 and 5 seats are ‘safe GPC’ or ‘likely GPC’. This shows a local, regional ‘opening’ which could be exploited with the right electoral messaging and tactics. 4 NIPR not included in Poll aggregation/count. it was a very wild and wintery day some folks were unable to attend. Presentations from the two nominee candidates were very well received. Climate Action Powell River Society (CAPR) has been very busy. We recently co-hosted, with the Council of Canadians and Unspoiled Coast, a talk by Andrew Gage of West Coast Environmental Law. His daughter took a very great interest in the Meatless Monday project (see below) and is planning to launch it in Victoria. We will have a table at the Seedy Saturday event which takes place on March 16th. We have assumed responsibility for Earth Month and an Earth Day event in Willingdon Park on April 22nd. At this event the North Island Powell River Green Party will have a table/tent, weather permitting. We are also planning an electric car parade, a movie called Anthropocene, and more . The local monthly magazine Powell River Living April edition will feature Earth Month articles submitted by CAPR and company. CAPR continues to sit on the City of Powell River Sustainability Committee. This committee and the City of Powell River most recently approved a Meatless Monday project. The website is a work in progress. It includes a pledge inviting readers to participate in giving up meat for one or more days. Once the project is completed, the results will be measured to indicate the amount of carbon saved. This project is just getting underway and so far we have responded to a letter to the editor and presented to the Chamber of Commerce This last presentation generated interest in the business community so we expect good results from that. The NIPR EDA participated in the Coldest Night of the Year (CNOY) on February 23. Jay van Oostdam, NIPR’s Financial Agent, convinced one of the event organizers that they should use compostable cups/spoons for their chili and drinks. So, we formed a Team Green: Three were walkers and four were responsible for the compostable dishes/utensils. CNOY has three ‘water stations,’ and Team Green had a NIPR person at each station to ensure the compostables were kept separate from regular garbage. The Comox Valley Regional District (CVRD) provided compost bins and a ticket to take all the waste to the composting centre the next day. A CNOY volunteer took all the bins (thank goodness she had a truck!) to the composting centre, rinsed out the bins, and returned them to the CVRD. We later learned from the CVRD that we diverted 30 kg (about 66 pounds) of compostable waste that night. Next year that should go up significantly because, as this was the first run-through of this initiative, there were things we would do differently next time. Team Green also raised $900 for the CNOY event, which went to Dawn to Dawn and the Comox Valley Transition Society - both of which deal with homelessness. NIPR has had a contested nomination this year - contested in a good way! We initially had three candidate nominees, but one withdrew. Our nominees were Mark de Bruijn and Blair Cusack. We held three meet-the-candidate-nominees sessions: The first in Campbell River on February 4, the second in Powell River on February 10, and the third in Comox on February 20. Around 30-40 people attended the meet-and-greet in each location, and that was encouraging. The events were lively, with good participation from the audience. NIPR really put our candidate nominees out there for people to get a good sense of. Many people have renewed or started memberships, and we hope for a good turnout at the Nomination Meetings. Interestingly, both candidate nominees and some volunteers called pretty much all the Green Party supporters in the Campbell River, Comox, and Powell River areas. Blair, one of the nominees, asked people what their three main issues are, and graphics of what he found are below. The Candidate Nomination Meetings were held on March 10, 2019, at the Black Creek Community Centre and the Powell River Library simultaneously. It was an interesting experience for NIPR to conduct a legal event in two locations, connected electronically. The technology gods cooperated and all went well. It was exciting to be connected on both sides of the Salish Sea. Mark de Bruijn (centre) and partner Carol Thatcher, with enthusiastic supporters. We appreciate donations from strong Green supporters. Thank you. Mounting an election campaign in a riding of our size is daunting in many ways, not least of which is financially. As we approach the 2019 election, please take this opportunity to keep our momentum going…and maximize your tax deductions for 2018! Make a comment on our newsletters. We’re always looking for feedback. Greens are defined by a personal responsibility to the community, the quality of decisions we make, and our ability to defend those decisions. We are not responsible for the success or failure of other political entities, and Greens are committed to earning the respect of voters. © 2019 Greens of North Island - Powell River Approved by the official agent. Kudos to Blair Cusack for his timely Polling report for GPC/NIPR. Being relatively new to this this riding and the GPC, I found this information helpful. My partner and I are hoping to hear more detail on the local NIPR election strategy at the campaign launch on March 23… hint, hint. We have a great chance to win this fall!